Cathy graduated from CDI College and was registered in 2006. 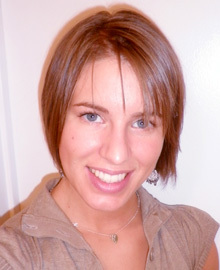 Since that time she has had many rewarding experiences which have helped her grow as a Registered Massage Therapist. Some highlights include volunteering at marathons, treating expecting mothers throughout their pregnancies, and working with other health professionals to aid in the rehabilitation of a client’s injury. After starting her career in Ontario, she decided to transfer her qualifications to BC and move to Vancouver. She is excited to continue practicing her profession at Pacific Chiropractic and Massage Therapy and its emphasis towards preventative health! Cathy brings experience and strength in dealing with acute and chronic injuries due to sports, work and overuse injuries, pre-natal massage, deep tissue treatments, as well as the knowledge to aid clients in setting up a treatment plan that will suit their specific needs. During the past few years she has been fortunate to have treated many different people of various stages of life and ages, from kids to athletes, desk workers to seniors in permanent residence, all with the same basic goal…to feel relief and promote a healthier lifestyle. She understands that each patient is unique and has different needs and expectations from their treatment. Keeping good lines of communication open and encouraging feedback enables the patient to better understand the root cause of their concerns and will aid in the healing process.